Illustration © The Estate of John David Roberts. Reproduced with the permission of the William Roberts Society. Text © David Cleall, from Sotheby's London, Modern and Post-War British Art, 10 May 2012 (lot 115). In the Straight is one of four known compositions by William Roberts on horse-racing subjects. 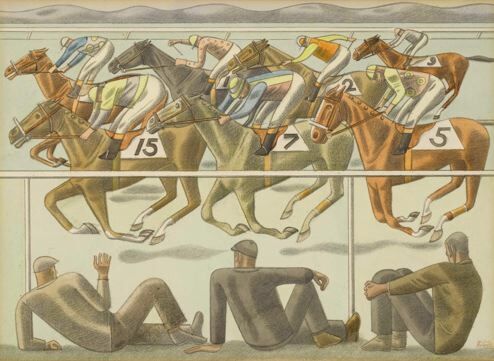 The Paddock (Bradford Art Gallery) and Before the Race (National Museum of Wales, Cardiff) date from the late twenties and have an emphasis on the interaction between the various types of people that racing brings together  jockeys, owners and punters. The quite different compositions of In the Straight and Cantering to the Post, both from around 1949, demonstrate Roberts's engagement with the depiction of horses' movements on a two-dimensional surface. In Cantering to the Post (Tate Gallery) Roberts adopts the compressed perspective of a 'three-quarters front' viewpoint to create a composition which is in many ways satisfying and exciting. However, the unusual 'side-on' viewpoint of In the Straight creates an interesting 'Muybridge-esque' record of an instant in a race as if it were recorded by a photograph, and leaves the viewer free to explore the composition's various contrasting elements. Cantering to the Post was submitted to the Royal Academy Summer Exhibition in 1949. According to Roberts, although it was accepted by the Hanging Committee it was not hung, 'perhaps because only the Munnings' breed of Race horse is allowed to show its Paces there'. In 1951 it became Roberts's first painting to be purchased by the Tate Gallery. In the Straight was first exhibited at the Leicester Galleries in July 1949, along with Cantering to the Post. It was exhibited again in November that year, in Roberts's one-man show 'New Drawings, Satirical and Otherwise', when it was purchased by Ernest Cooper, the owner of a successful health-food business based in Wigmore Street (the London Health Centre), whose portrait by Roberts had been exhibited at the Royal Academy that summer. Cooper was to become Roberts's chief patron, eventually acquiring some 20 oils and nearly 50 other works (mainly watercolours), mostly bought direct from the artist. In addition to racehorses, other kinds of horses became the subject of Roberts's work. In 1916 Roberts enlisted as a gunner in the Royal Field Artillery. Grooming, feeding and caring for the gun horses was an important part of his work . As Roberts and the horses moved from basic training to active service on the Western Front he became intimately aware of the mutual dependence of the gunners and their animals. Roberts's paintings 'Feeds Round!' Stable-time in the Wagon-lines, France (1922), in the collection of the Imperial War Museum, and Grooming Horses (c.1916) in the Government Art Collection, document this aspect of his military life. In the early 1940s Roberts lived for some time in rural Oxfordshire, and horses in a local gypsy camp and the shire horses he saw working in the fields became the subject of paintings. The ceremonial role of horses was celebrated in Roberts's spectacular Trooping the Colour (19589), also owned by the Tate Gallery. Letter of 23 July 1951 quoted on the Tate website.